Healthy and glossy long black hair can be a stunning statement style, especially when paired with beautiful bangs and luxurious layers. Short hair, whilst easier to maintain and take care of, isn’t for everyone. So, long layered hairstyles with bangs for black women can be a savior which will help to flaunt their natural hair as well. 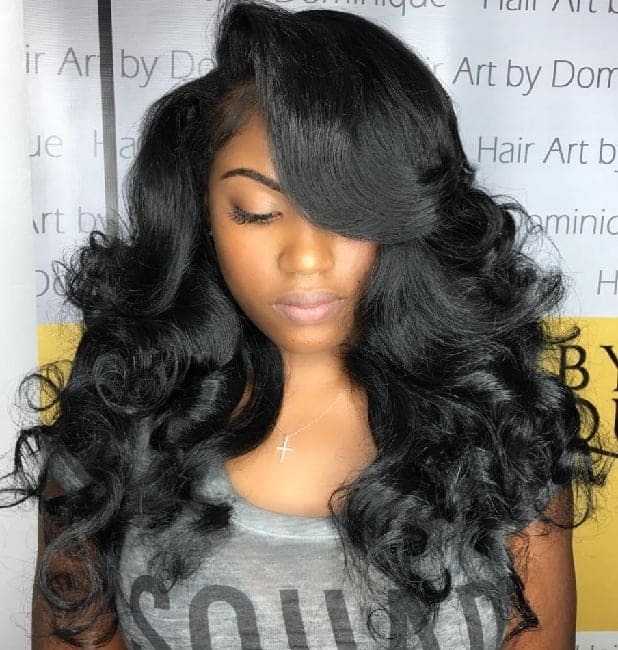 If you are looking for a very contemporary new ‘do but don’t want to lose your length, then here are 5 of the top and most trendy examples of black long hairstyles with bangs and layers around at the moment. A chic long layered hairstyle with bangs for black women. These eyebrow skimming bangs are a perfect way to frame the face and draw attention to those long glossy locks. Ideal for: Heart, triangle and square faces. How to Style: By keeping the length of the hair longer with soft layering to help it curl, you can soften any angular parts of the face whilst having a very luxurious look. Side sweeping bangs look great and are the perfect way to cover a broad and bold forehead with the long layered hair laying on sides. Ideal for: Long, heart, square and triangle faces. How to Style: The side part is given a huge boost of volume by blow-drying with a large barrel brush. The hair is then curled and softly brushed for a more natural style. Layering around the front and sides really enhance this girlish look. 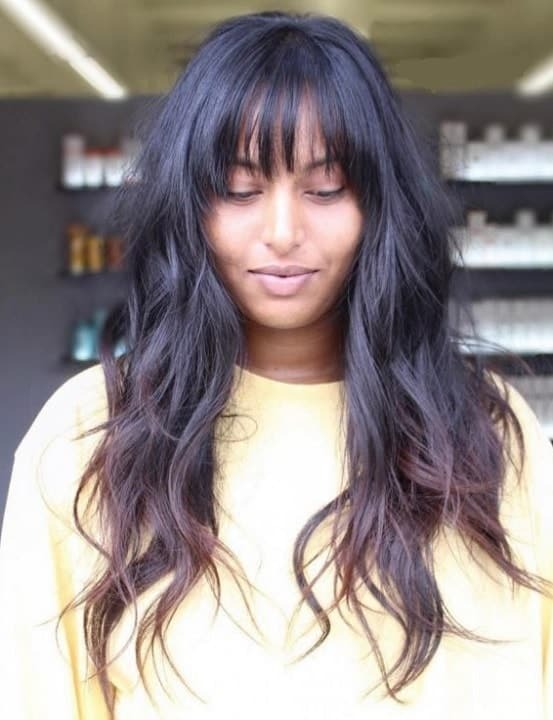 Thick bangs can look old-fashioned and heavy but by styling them into a side part or side fringe you can be assured of a more modern and flattering style. This long hairstyle for black women with bangs and layers will give a casual yet elegant look. Ideal for: Heart, long, oval, triangle and square faces. How to Style: The long side-sweeping fringe sits flat against the forehead but is given some definition with subtle layering and flicks around the face. The lengths of the hair are left in natural and slightly tousled ringlets. Oval faces can pull off most fringe styles and this choppy cut is a great example of making the best of what mother nature gave you! Ideal for: Oval, long, and round faces. How to Style: The key to this look is having healthy and sleek hair. Condition well and rinse with cold water to enhance that glossy look. Soft layering around the front of the hair gives this look a contemporary boost. Bangs and layering on black long hair don’t have to mean poker straight hairstyle. If you have a mop of wonderful curls, then you can incorporate them too. Ideal for: All face types! 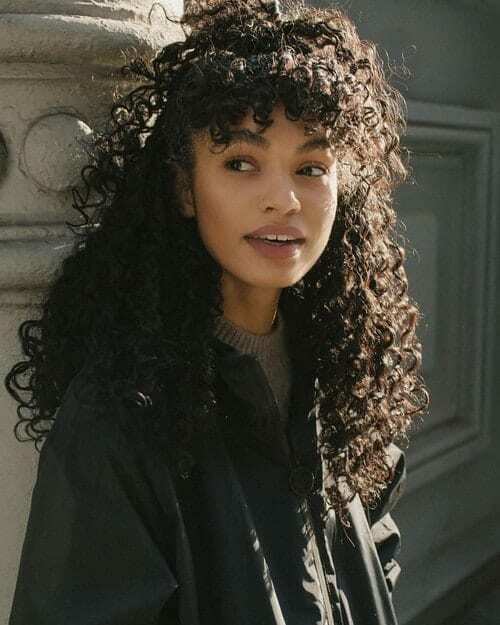 How to Style: The curls are heavily layered across the top of the head which not only helps them sit in a wonderfully wild fashion but also creates that floppy and undefined fringe section. Sun-Kissed highlights through the ends of the hair will really add some dramatic definition. These are the cherrypicked black hairstyles with bangs and layers for long hair lover women. Experiment freely without losing the length!